Taking a stroll through a subway station in France generates renewable power. Sal holds a political science degree from the George Washington University. He’s written about all things environment since 2007. Each day for the last six months, approximately 5,000 people passed through the turnstiles of the Saint-Omer subway station in northern France. Chances are good that the vast majority of them were so focused on the minutiae of their daily lives—Respond to the boss’ email now from my smartphone or from my computer when I get to the office? Un café express or un noir at the corner coffee cart?—that they didn’t realize that by putting one foot in front of the other they were serving the greater good by producing clean, renewable energy. 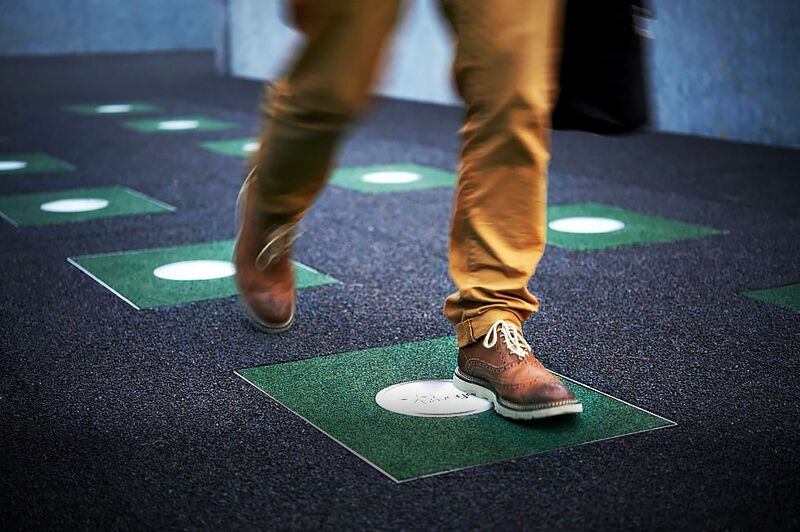 In March, 14 flooring tiles from London-based clean-tech company Pavegen Systems were installed at the mass-transit depot. The tiles, each roughly 7 by 24 inches, generate renewable electricity from the otherwise wasted energy of footsteps. When a walker’s foot makes contact with the tile, it bends inappreciably, depressing an average of five millimeters each step and creating approximately seven watts of converted kinetic energy in the process. The slabs, made from 100 percent recycled rubber, can store energy for up to 72 hours via small built-in batteries. The energy captured by the tiles at the Saint-Omer station has been used to power an LED bench lighting system and two USB ports installed in nearby benches, allowing commuters to charge their electronic devices as they wait for trains. The concept was conceived in 2009 by Laurence Kemball-Cook, then a graduate student in industrial design at Loughborough University in the United Kingdom. Since the first Pavegen tiles were installed at a U.K. school in 2010, the concept has spread across the Atlantic to the U.S. In January, Pavegen installed eight tiles in a hallway outside the cafeteria at New York City’s Riverdale Country School, the first American venue to feature the kinetic units. The captured electricity has been used to power a phone-charging dock and LED information boards that explain the innovation and potential uses of the technology. “We received a highly positive reaction from both teachers and students—the fact that we’re educating aspiring innovators on a people-powered alternative to fossil fuels, whilst maintaining the fun factor, is a huge result for us,” says Kemball-Cook. To read more click this link or the link at the top! Posted in Think Green!. Tagged renewable power, Taking a stroll, Think Gfeen!